The team brought along 4 units of manual-powered water filtration systems, 1000 jerry cans and 2000 disposable underwear to support the re-hydration and hygiene conditions as Chennai seeks to recover from the massive floods. 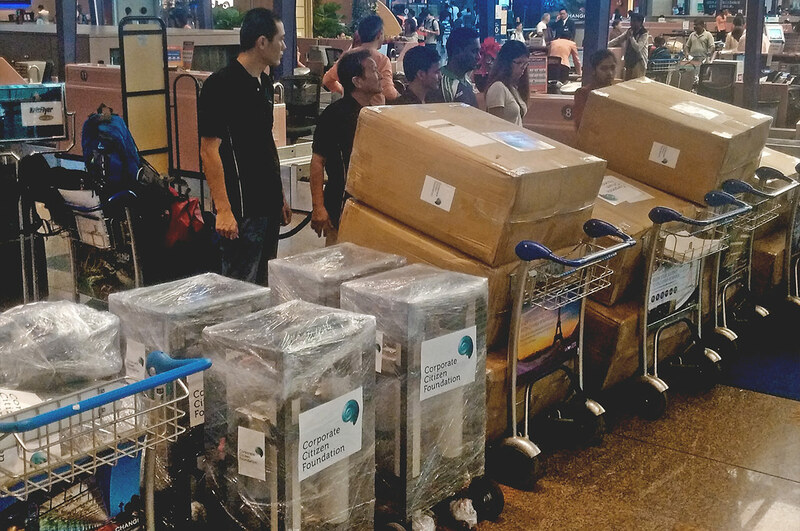 The relief supplies items were flown complimentary by Singapore Airlines, which resumed its flights to Chennai today. Access to clean water is the prevailing problem facing the flood victims, with more than 200,000 people displaced and close to 300 lives were lost. (left) Staff of HSL Constructor and Golden Season – partners of CCF. (right) In line of service – The team brought along relief items flown complimentary sending off the relief team and supplies by Singapore Airlines.